Based on patient reviews submitted to independent laser eye surgery review website Lasik-Eyes.co.uk. A distinguished ophthalmic surgeon, Mr Alex George is an expert in laser vision correction, refractive lens exchange and cataract surgery. He is fully registered with the General Medical Council (GMC) and the Irish Medical Council (IMC) and has also received a Certificate of Refractive Surgery (CERTLRS) from the Royal College of Ophthalmologists. In addition to this, he has specialist training in corrective eye surgery which he received in the US. Mr George began his career and training at Aligarh University where he graduated with a medical degree, and, after obtaining a Masters and Diploma, specialised in Ophthalmology at Bombay University. He has since gone on to obtain FRCS(Ed) and FRCOphth qualifications, as well as extra qualifications from the New Dehli National Board of Examinations in Ophthalmology. Mr Ali Mearza FRCOphth is the Clinical Director of ophthalmology and lead consultant ophthalmic surgeon at London's Imperial College Healthcare NHS Trust, the UK's first Academic Health Sciences Centre. His specialist interests are cornea, cataract and laser refractive surgery. As well as treating eye disease, he has particular expertise in reducing dependency on glasses and contact lenses through laser eye surgery or lens-based surgical techniques. Having qualified from Charing Cross & Westminster Medical School in 1996, Mr Mearza has performed over 10,000 procedures including laser eye surgery, refractive lens exchange and cataract surgery. Every year people travel from over 25 countries specifically to see him for his opinion and surgical expertise. He also has a keen interest in charitable ophthalmic work, something particularly close to his heart, and has been on numerous trips abroad helping some of the world's neediest people see again. Mr Barsam has full specialist registration with the General Medical Council and is one of only a handful of Consultant surgeons in the UK who is fellowship trained in Cornea, Cataract and Laser Vision Correction. He has undergone extensive rigorous training at the world’s most prestigious institutions, Cambridge University and University College London Medical Schools, where he graduated with Honours and a Distinction in Surgery. He completed his residency training at Moorfields Eye Hospital and went on to complete a one-year fellowship in New York where he worked closely with Drs Donnenfeld and Perry, two of the US founding fathers of modern Cornea and Refractive Surgery. He followed this with an additional Cornea, Cataract and Refractive Surgery Fellowship at the Western Eye Hospital in London. In addition to this, Mr Barsam has been carrying out research towards a Doctorate in Medicine at the University of Cambridge on corneal ectasia. He has published over 30 peer review publications, 6 book chapters and is the co-author of a comprehensive textbook of Ophthalmology, which is used by Ophthalmologists around the world. He is also a member of the editorial board for Cataract and Refractive Surgery Today Europe. Bruce Allan is Service Director for Refractive Surgery at Moorfields Eye Hospital, and one of the most experienced refractive surgeons in the UK. Recent television appearances include BBC News, BBC 1 Inside out, and Channel 4 Embarrassing Bodies. He regularly chairs and presents at international meetings, provides expert advice for NICE and MHRA, and has published widely on laser eye surgery, ICL implants, and multifocal intraocular lens implantation. He balances time in private practice with a strong and continuing commitment to NHS care, specialist surgical training and research. 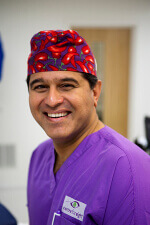 He has served at Moorfields for over 20 years, is a national merit award holder, and has a strong reputation for surgical innovation, teaching, and the highest standards in patient care. Notable achievements include spearheading the introduction to the UK of safe techniques for key-hole corneal transplantation, new applications of mathematical modelling to enhance accuracy in laser vision correction, and a key role in establishing ICL implantation as a safe treatment alternative for younger patients with high spectacle prescriptions. Experience, state-of-the-art equipment and an ability to put patients from all walks of life at ease are the hallmarks of his practice. As he is one of the leading refractive surgeons in the world, it's fitting that Mr. Pillai decided to found AVC on Harley Street, the world famous centre for medical treatment. Mr Pillai has over 15 years experience in laser eye surgery and has a fellowship in cornea and refractive surgery. As medical director of Advanced Vision Care he has performed many successful procedures using Laser Insitu Keratomileusis (LASIK) and has a friendly, hands-on approach. The central London surgery deploys advanced technology whilst putting patients at ease. Professor Dan Reinstein is the Medical Director of London Vision Clinic and an internationally renowned laser eye surgeon. For more than a decade, he has dedicated himself solely to laser eye surgery - one of the few ophthalmic surgeons in the UK to do so. After qualifying as a LASIK surgeon, Professor Reinstein discovered that ultrasound could be used to scan the surface of the cornea to within one micron – 1/1000 of a millimetre. This led him to build a prototype of what would become the Artemis™ scanner - now the world’s most accurate corneal scanner. Later, he joined the specialist team at Meditec (later Carl Zeiss Meditec) that developed the revolutionary MEL 80 laser. This immediately became the benchmark laser for the industry. The London Vision Clinic has now worked closely with Carl Zeiss Meditec, one of the world’s leading optics manufacturers, for several years, and Prof Reinstein holds several patents relating to laser eye surgery. Mr David Allamby is the founder and medical director of Focus, a refractive eye clinic based in central London. This is a well renowned, prestigious clinic which has been named as a European Centre of Excellence, an accolade achieved in 2012. 1. Blended Vision - This is a treatment for presbyopia (the age-related need for reading glasses). This surgical alternative was performed by Mr Allamby in January 2003. 2. Z-LASIK - LASIK surgery using advanced small bubble technology (aka SBT) which is used to treat both reading and distance vision. 3. KAMRA implantation - Yet another first was Mr Allamby's implantation of the KAMRA corneal inlay which like the Blended Vision treatment is used for those suffering from presbyopia. Mr Allamby has also published a scientific work about ocular scar formation which was funded by a Wellcome Trust grant and undertaken at the University of Manchester. In addition, leading eye institutions such as Moorfields Eye Hospital and the Manchester Royal Eye Hospital have had the benefit of Mr Allamby's expertise. With such a list of accolades, it is hardly surprising that Mr Allamby has provided surgical training to visiting doctors worldwide and is the surgeon of choice for numerous celebrities. Professor David Gartry was the first surgeon to perform laser eye surgery in the UK in 1989. Since then, he has performed over 25,000 laser eye surgeries and an additional 15,000 cataract and refractive lens exchange procedures. He is now one of the most successful laser eye surgeons in the UK with over 30 years experience in treating complex ophthalmic conditions. Having graduated from Glasgow Caledonian University in 1978 with a first class honours degree in Optometry, Professor Gartry is now a senior consultant at Moorfields Eye Hospital. Due to his popularity, he also opened his own eye clinic on Wimpole Street in London in 2015 where he operates from in conjunction with his position at Moorfields. 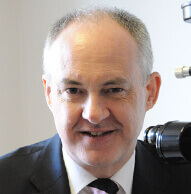 Professor Gartry is a member of a number of prestigious societies, including the Royal College of Surgeons, The Royal College of Ophthalmologists and The Royal Institution. He has also published over 50 scientific papers relating to laser eye surgery, cataract surgery and corneal surgery, as well as being the co-author of several ophthalmic books. A renowned ophthalmologist who is considered an expert in his field, Dr Teenan has had a range of specialist training in refractive surgery. He trained at the University of Dundee and graduated in 1992, going on to take up his first ophthalmology position at the Glasgow Royal Infirmary. Continuing his career in Glasgow, Dr Teenan undertook a Corneal and External Diseases Fellowship at Gartnavel General Hospital. 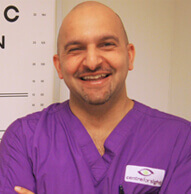 Dr Teenan is also a consultant ophthalmologist and examiner for the Royal College of Surgeons. As a distinguished ophthalmic surgeon, Mr Dimitris Kazakos has extensive experience of performing corrective eye surgery. After completing his initial training at the Marmara University of Istanbul, he went on to take up an ophthalmology post at the Oxford Eye Hospital. After this he went on to practise at the Essex County Hospital, Bristol Eye Hospital, Queen’s Medical Centre, Ipswich General Hospital and the Southampton Eye Unit, where he completed a Fellowship in Corneal and External Eye Diseases. In addition to this, he has completed further surgical training and a Refractive Fellowship at the University of Crete, where he worked with Professor Pallikaris, who helped to pioneer the use of LASIK. Currently working at the prestigious London Vision Clinic, Glenn Carp qualified as a doctor in Johannesburg in 1996 before moving to the UK and undergoing one of the most rigorous training programs undertaken by any eye surgeon. "I will not lie and say I wasn’t nervous. But I watched over 500 surgeries and was confident having seen the results. The surgery was over and done with before I knew it and the recovery was very quick. I was back at work the next day and operating just three days after surgery. I can now see 20/12." While still in South Africa Mr Carp won the Tetski Patterson Award for clinical research and received the Elli Dahan registrar of the year award in recognition of his outstanding. Currently employed at Advanced Vision Care on Harley Street in London, Dr Helgeson graduated from Gothenburg University in 1984, going on to become a consultant ophthalmologist in 1991. His speciality is anterior segment eye surgery and he has written several papers on the topic which, reviewed by his peers, he has presented at conferences worldwide. Dr Helgeson is also a medical director of Capio Medocular, one of Sweden’s major eye clinics. STAAR Surgical, a leading manufacturer of ICL lenses, heralds Dr Helgeson both as a medical and international course advisor. In fact, he is in a unique position to advise his patients on Implantable Contact Lenses (ICL) as in 2004 he underwent the procedure himself, ironically on the recommendation of his own patients! Indeed, Dr Helgeson's patients can be sure they are in good hands as he has affiliations with several internationally recognised bodies including the European Society of Cataract and Refractive Surgeons and the Swedish Ophthalmic Society. If one is after experience and longevity, look no further than Mr Julian Stevens who has been at the renowned Moorfields Eye Hospital since 1988 and specialises in laser refractive surgery. 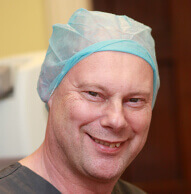 Mr Stevens has the distinction of being an examiner for the UK's Royal College in Laser Refractive Surgery. He is an advisor to the British Society for Refractive Surgery and is also on the board for the International Society of Refractive Surgery. In addition, he is well decorated, having won prizes from both European and American bodies dealing in refractive surgery. Mr Stevens has set up various Wavefront training courses at Moorfields and his opinion is sought after both in the UK and internationally. His peer reviewed papers are always well received and he is in great demand to deliver keynote lectures at ophthalmologist meetings. Unsurprisingly, his pedigree was established from before the start of his career when he won a scholarship to study medicine at Merton College, University of Oxford and graduated top of his class in 1980. Given that Moorfields is one of the top eye hospitals on the planet, it's hardly surprising that its Arthur Steele Unit employs some of the best laser eye surgery consultants in the UK, including Mr. Angunawela. He is a Fellow of The Royal College of Ophthalmologists and has experience and knowledge of a wide variety of eye conditions. Mr. Angunawela specialises in laser eye surgery, corneal surgery and cataract surgery and completed two and a half years of specialist fellowship training in cornea and laser eye surgery at Moorfields Eye Hospital and at the Singapore National Eye Centre. He is one of the most highly awarded Consultant Ophthalmologists and has been given the Gold Medal by the UK and Ireland Society of Cataract and Refractive Surgeons 3 times. Amongst other awards, Romesh was also awarded an Achievement Award by the American Academy of Ophthalmologists. He is considered an expert in the fields of corneal and laser eye surgery and is often invited to speak at international medical conferences. Romesh's practice is based at Moorfields Eye Hospital in London, where he is supported by a staff of highly trained consultant anaesthetists, nursing and technical staff. Moorfields is the leading eye hospital in the world and has a 200-year history as a centre of excellence. It is trusted by patients to offer the highest standards of eye care with access to cutting-edge science and technology, without the commercial pressures of many smaller clinics. Based at the London Eye Hospital, Mr Saj Khan has come to specialise in laser refractive eye surgery and the application of the Intralase femtosecond laser in corneal surgery. He completed his fellowship training in paediatric ophthalmology at the world famous Great Ormond Street Hospital for Children and has the added advantage of having undergone laser vision correction himself. This may well put him in a stronger position than others when it comes to advising his clients as his words are likely to carry more gravitas. Mr Khan's particular interests are dry eyes and visual problems related to driving and he is actively involved in the training of other ophthalmologists and their support staff both in the UK and abroad. In addition to being the Medical Director and Consultant Ophthalmic Surgeon of the Corneo Plastic Unit and Eye Bank at the Queen Victoria Hospital in East Grinstead, in 1996, Mr Sheraz Daya also established East Grinstead's Centre for Sight. This centre has the distinction of being the first in the UK to offer INTRALASE refractive eye surgery which produces better outcomes and is generally considered a safer technique. Additionally, Mr Daya is internationally known for his work on refractive cataract surgery and both corneal and stem cell transplantation. Graduating in Ireland in 1984 with honours, Mr Daya served his internship at the Royal Belfast Hospital in Northern Ireland prior to doing his residency and fellowship in the USA. He then returned to the UK to do the first ever LASIK procedure carried out on these shores. Not satisfied with this, he has since striven to make the Centre for Sight a centre of excellence and is a leading authority on any matter concerning the cornea and the front of the eye. Mr Sheraz has pioneered a number of procedures in the area of Stem Cell Transplantation and is a member of prestigious committees on both sides of the Atlantic. Ms Valerie Saw has been a longstanding full time consultant ophthalmologist at Moorfields Eye Hospital (2007 – 2015). She specialises in laser refractive surgery, cataract and implant surgery, dry eye and corneal transplantation. Recognised by her peers for her expertise and experience, she is an Examiner and Committee Member for the Royal College of Ophthalmologists’ Certification in Laser Refractive Surgery. She conducted her medical training at the University of Sydney, where she received the University Medal for coming first place on the Honours list. She has been trained at the highest level in complex corneal and cataract surgery, having spent 4 years in advanced specialisation at Moorfields Eye Hospital. Due to her experience, she is able to offer a choice of treatments and customise these to the patient’s individual situation. Amongst her accolades Ms Saw is a council member and conference co-organiser for the British Society of Refractive Surgeons (BSRS). She is also a member of the American, European and UK and Ireland Societies of Refractive Surgery (ASCRS, ESCRS, UKISCRS) and the European Corneal Society (EuCornea). She is a member of International Sjogren’s Syndrome Registry Review Panel (SICCA) and medical advisor for the Dry Eyes Medical website. She is a regular invited speaker at conferences and teaching courses both in the UK and abroad. Ms Saw no longer treats patients at Moorfields Private. Her private practice has moved to the Harley Street area (Advanced Vision Care). 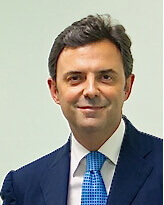 Vincenzo Maurino holds the post of Consultant Ophthalmic Surgeon in Laser Refractive Surgery, Corneal Surgery and Cataract Surgery at the world-renewed Moorfields Eye Hospital, the largest and one of the best specialist eye hospitals in the world. He is also Director of the Cataract Service at Moorfields and Visiting Professor of Corneal Surgery at the prestigious University of Rome Tor Vergata. Mr Maurino completed two years specialist fellowship training in cornea and laser eye surgery at Moorfields Eye Hospital and was then appointed substantive Consultant by Moorfields in 2003. Vincenzo is a highly awarded consultant ophthalmic surgeon and as a well-known expert in the fields of corneal, laser eye surgery and laser cataract surgery and lectures at international medical conferences. He has personally performed well over 20000 eye surgical procedures and is a respected and internationally renewed trainer for corneal, laser and cataract surgery. He is one of the few surgeons in the UK to have been fellowship trained in Refractive Laser Vision Correction Surgery and also holds the Royal College of Ophthalmology of England Certificate of Competency in Laser Refractive Surgery.